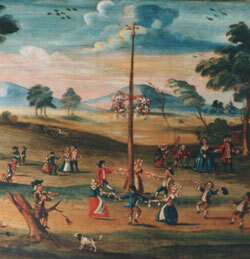 Maypole dancing is most often associated with May Day celebrations all over the world but also happens at other times of celebration. Originally commemorating the arrival of spring, May Day was a holiday with much merry-making. A young girl was selected as May Queen often with a May King. They were “crowned” and presided over the festivities which included feasting, singing, music-making and dancing. The album, Maypole Dance Music can be downloaded on iTunes®. Click on the button, right, to be transferred to the iTunes Store or click here to buy a CD. The celebration of May Day and Maypole Dancing was banned for a short time in England during the 17th Century but has continued to be enjoyed since that time.